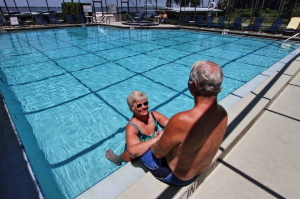 Senior living communities are plentiful in Florida, but Lake Griffin Harbor in Leesburg, FL, can satisfy the lifestyle desires of active adults who crave the great outdoors. Whether you seek to spend your time fishing for your next big catch, enjoying community activities with your friendly neighbors, or exploring the gorgeous sites of Central Florida, Lake Griffin Harbor is the right community for you. Unlike other senior living communities, Lake Griffin Harbor offers a picturesque lakeside setting on the southeastern shore of Lake Griffin – 16,000 acres of beauty that has played host to trophy bass fishing tournaments and yielded some true lunkers over the years. Although, if fishing isn’t your passion, you may want to just explore the area by boat. In fact, you aren’t even limited to Lake Griffin – you can navigate all the way to the Atlantic Ocean from our community in just a few short hours. Our 55-slip marina offers you the perfect place to keep your watercraft so it’s always ready for your enjoyment, and our gated dry dock storage provides the perfect location to store your vessel when it’s not in the water. Contact one of our Lifestyle Consultants at Lake Griffin Harbor today to learn more about how we rise head and shoulders above other senior living communities in or near Leesburg, FL.